Of all the aspects of the sport of turkey hunting that I hold dear, none may be more thrilling than the moment in which you know the gobbler you have been coaxing for what seems like an eternity is finally headed your way. Despite each moment like this not being “my first rodeo,” it remains the point of the hunt that I tend to hyperventilate and reach stroke levels of anxiety. My eyes are bouncing left to right as I search for the first sight of a blue and red head, and my ears strain to hear him drumming or walking in the leaves. To me, this is gut check time, which is what I love so dearly and keeps me coming back for more season after season. I typically hunt denser timber than my counterparts in the Midwest or Northeast do, given that Alabama has essentially become one giant pine plantation via the years of logging and replanting. So many times, I am only able to see the turkey for a matter of seconds before I pull the trigger. To be exact, I have probably killed more turkeys in this type of scenario than ones in which I was able to see the turkey coming for a hundred yards. Because of this, I have had to become adept at anticipating what the gobbler is going to do, or better yet, adjusting once I determine, or see, where he is. When a turkey “breaks the barrier,” as I call the imaginary line in which I feel he’s fully committed and I need to begin looking or listening for him, I try to remain as motionless as possible. I am going to face where he last gobbled, or try to predict if he is going to move left or right as he approaches, based on my knowledge of the terrain or if I notice any snags that may “steer him” to either side. I then try to use my ears as much as possible. In thick cover, or in rolling terrain, you are likely going to hear a turkey walking or drumming long before you see him, so your ears become your best friend. Don’t get me wrong, I still use my eyes, and try to limit moving my head as much as possible. Let’s say the turkey surprises me and shows up to my left (which, being right handed and right eye dominant, is my ‘kill side’ in which I can move if need be), I then have to quickly decide a) is he in range b) he is about to walk behind a tree or obstruction that will block his view and allow me to move? You cannot hesitate if it is time to kill him; you have to time out when he is going to walk behind the tree and “snap” around. When he steps out, if you have the shot, you then kill him. 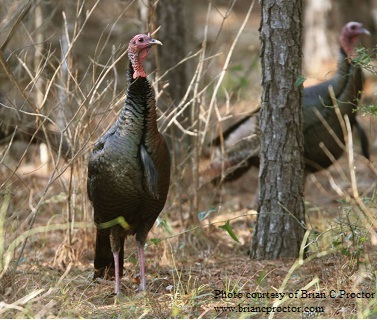 Turkeys coming up on your “blind side” are the most troublesome, given you have less mobility than to your kill side. Because of this, I tend to overcompensate to my right some to give me some wiggle room if he does drift right. If he appears and I determine I will not be able to move, I then have an important decision to make. I can either cluck and purr to him to try to coax him back to my left, or I can try my odds with him drifting off and repositioning on the tree. Because I tend to err on the side of caution, I tend to sit still and hope he will drift out of sight. If I haven’t called in a few minutes, and he has not been spooked, many times he will walk right back to me and the drama will end. But again, if I had my druthers, I would want him to go left. However, turkeys do not follow a script. Many people ask me once the turkey breaks the barrier if I call to him or not. Because each turkey is different, I let the turkey determine that. If a turkey continues to gobble (which eliminates much of the suspense), I like to do a soft two-note yelp right on top of his gobbles. This has proven deadly for me, mainly because the turkey cannot course me well or at all and feels he needs to continue to search for the hen. If a turkey goes silent, I will stay silent with him until I feel I simply have to make him gobble to course him. For instance, if a turkey was last at eighty yards and closing the distance, and ten minutes or so have gone by without any proof of his existence, I will cut twice sharply, followed by a pleading three note yelp. More times than I care to admit, the turkey will blow my hat off immediately behind me and give me a heart attack. Hey, at least I know then where he is and then can formulate my next move. Several years ago I had a hunt in Alabama that summarizes all that I have discussed above. I was hunting a twelve year old pine plantation that you could not see more than thirty yards. A longbeard snuck in on me and when I saw him, was in my only shooting lane to my left side 90 degree angle. Because I knew he would bolt into thicker cover as soon as I moved, and I did not have any immediate moves, I sat motionless and let him drift on. He set up shop about fifty yards to my hard left in the plantation and proceeded to gobble his head off. Over the course of the next five minutes, I slowly and methodically eased around the tree until I was in a position to kill him if he walked back my way. I began yelping on top of his gobbles, and it was a matter of seconds until he reappeared and was rolled by my Remington at twenty steps. Had I panicked, I would have likely missed him, crippled him, or watched him sprint off into the sunrise. However, I was able to quickly decide my best move at the moment was none at all, and thankfully he gave me another opportunity. My advice to new hunters who find themselves in these sorts of situations is simple-don’t panic. The worst thing you can do is lose your cool and rush an errant shot. Be decisive, but also be cerebral. If you are going to kill turkeys in thick cover (or maybe even hunting hill country gobblers that seem to play jack-in-a-box and pop up out of nowhere), you simply have to learn how to make the critical moves (or non-moves) when a longbeard gets in the red zone.